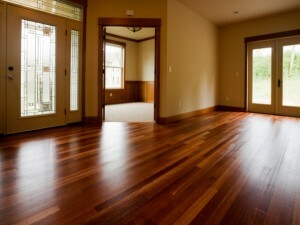 There’s nothing better than a finely finished hardwood floor, is there? It looks beautiful, smells crisp and fresh, and has a unique texture that makes you want to walk around barefoot as much as possible. Carpet Corner has hardwood floors for sale year-round because of their booming popularity. Hardwood floors are the cream of the crop when it comes to quality flooring products. They evoke a sense of natural classiness that no other floor can replicate. They’re beautiful to look at and feel smooth to the touch. When looking to choose the right hardwood floors for your home, there are a few factors you have to consider. You have to make sure the width of the boards is proportional to the area of your house your setting them in. Hardwood planks that are too wide or too narrow can throw off the look of whatever room they occupy. The wood species can also factor into your decision-making process depending on how much activity they will have to support and how often. For people who have kids and/or pets, a more durable wood species such as oak and maple are more practical choices since their hardness makes them more resistant to damage. More exotic wood species such as mahogany are better for showing off their beauty because of their superior attractiveness. The less activity on the exotic wood species of floors the better they hold up over time. Our hardwood floors for sale serve many beneficial purposes for you, your family, and your home. They are known for being safe, clean, low maintenance, sustainable, valuable, and more reliable than carpet. Carpeted floors are more likely to collect germs, dust, and other bacteria that can be hard to clean and get rid of completely. Hardwood floors do not have this same type of problem. They are much easier to clean often only needing a mop and bucket containing water and disinfecting cleaner. It’s a quick and easy way to keep your floors clean while looking and smelling great. Hardwood floors are still susceptible to damage though. They can be scratched, burnt, dented, and scuffed, but the beauty is that they can be repaired more easily than most floors. There’s no need to replace the floor when it can be refinished instead. It’s half the hassle, and it’ll save you time, money, and a headache. Carpet Corner has only the highest quality hardwood floors for sale from brands such as Shaw, Armstrong, and Mohawk. We offer free in-home consultation and professional installation to ensure that our customers are paired with the right type of hardwood floors that perfectly match the current interior aesthetic of their home.